Ben Bachik, ’20, prepares for a bake sale by pricing cookies and cookie sets on Friday, Nov. 16, 2018, in the Henderson Campus Center. 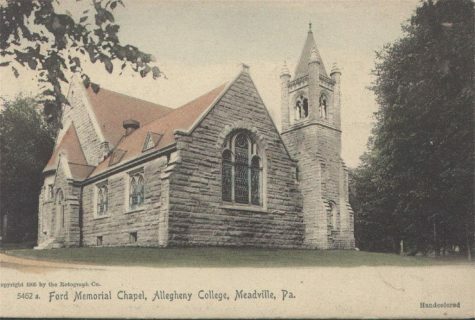 Proceeds generated from the sale supported St. James Haven in Meadville. Down on North Main Street lies a safe haven — a place where people can receive a hot meal, warm shower and bed to sleep. 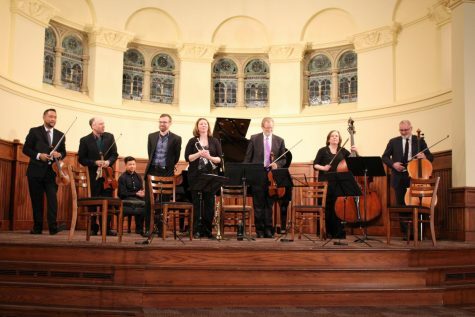 A place where people can breathe and ultimately find a sense of peace. 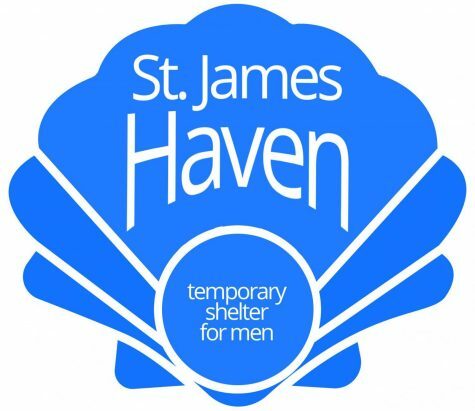 At 779 North Main St., approaching the heart of downtown Meadville, St. James Haven is a temporary shelter for men. As an outreach ministry of the Sisters of St. Joseph of Northwestern Pennsylvania, St. James has provided shelter to hundreds of men in Crawford County. Between 2016 and 2017 alone, it provided temporary shelter to 188 men, according to its website. As a nonprofit, every donation helps, according to Samantha Stump, executive director of St. James Haven. 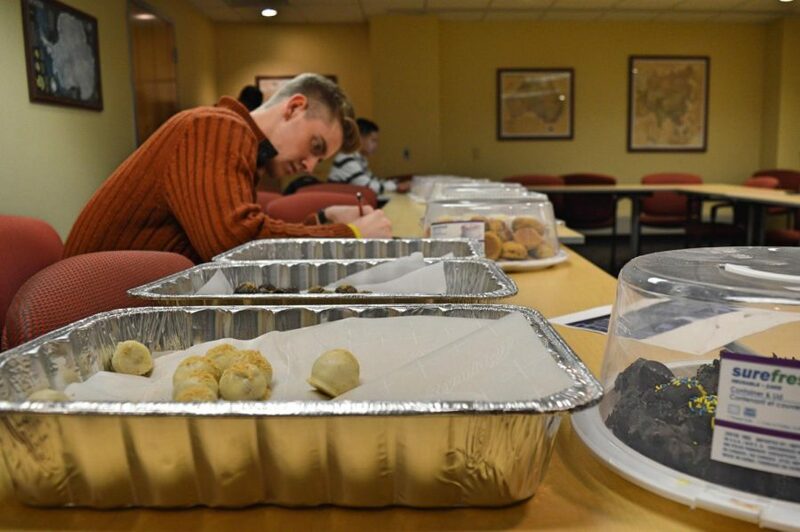 Through much of the fall 2018 semester, Allegheny students currently enrolled in COMRT 276: Media, Theory and Practice have been fundraising and raising awareness for the outreach ministry. “What Allegheny students are doing (for St. James) is going to make a difference,” Stump said. Ishita Sinha Roy, associate professor of communication arts/theatre, teaches COMRT 276 and first met Stump at a rotary meeting. Sinha Roy first approached Stump about a class project involving St. James at the meeting, according to Stump. Toward the beginning of the semester, Sinha Roy invited Stump to speak with the COMRT 276 students about St. James, according to Ben Bachik, ’20. Bachik said the class as a whole has fundraised for St. James in a number of different ways. 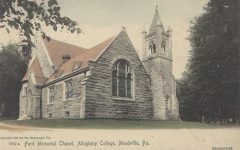 By dorm storming, Bachik meant that members of the class visited multiple dorms on Allegheny’s campus and asked residents to give to St. James. The class held a bake sale on Nov. 16, in which they spent that morning baking a variety of goods and sold them in the Henderson Campus Center from 7 to 10 p.m, according to Bachik. The group is now planning to hold a dodgeball tournament on Dec. 1, at the David V. Wise Center, in which teams pay $24 to participate as part of their fundraising for St. James. Overall, the students have a $3,000 fundraising goal they are trying to meet by the end of the semester, according to Jackson Sandusky, ’20. Sandusky is one of the two team leaders in the class for the St. James fundraising project. As a team leader, he said his biggest responsibility has been delegating tasks to the rest of his classmates. “Everybody in our group has done a lot of work, and it’s a big team effort,” Sandusky said. From the beginning of the project, the group has been excited to work together and raise money for St. James, according to Sandusky. The class recognizes the difference that donating can make for this local cause, and Sandusky said each class member has dedicated a significant amount of work to make the project a success. For him personally, Sandusky said that fundraising for St. James goes beyond receiving a class grade. Stump said any amount of fundraising will help St. James, since it relies on contributions from the community. The shelter can accommodate 14 men per night, according to its website, and 365 days a year, it provides food, showers, a bed and access to housing and mental health agencies for each guest. Money coming in may also help St. James pay electricity, gas and water bills, according to Stump. The overall mission of St. James is to be a temporary safe haven — a “landing place” for homeless men while they work to improve their lives. It partners with other organizations and agencies in the community to ensure each guest will ultimately better their living situation for the future. As the executive director, Stump said her main responsibility is “to make sure that St. James Haven operates on a daily basis.” She makes sure the shelter has enough food for the guests at any given time, manages the ministry’s budget and hires staff, among other responsibilities. 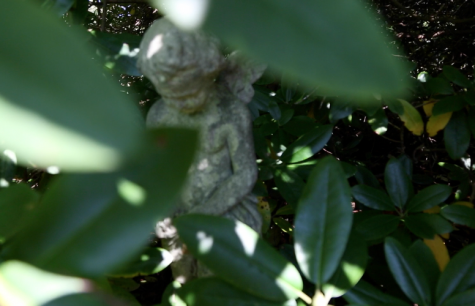 Despite all that Stump does for St. James, she emphasized how much of an impact the guests at St. James have had on her.